Cuteness, feminine blooms and freshness in one bouquet. This splendid floral arrangements features rose lilies, pink gerberas, white and green chrysanthemums, all hugged with red hypericum and lush greenery which gently finish the arrangement by adding an extra special look. A perfect gift for a newborn baby girl. So thrilled with the impressive flower display I received. It was over the top! Perfect flowers. They were packaged very good. It was a pleasure to speak with their team and order these beautiful flowers. Say a big thank you to your florists from me! The service is very reliable, I ordered the flowers yesterday and they arrived today looking wonderful. Thanks! 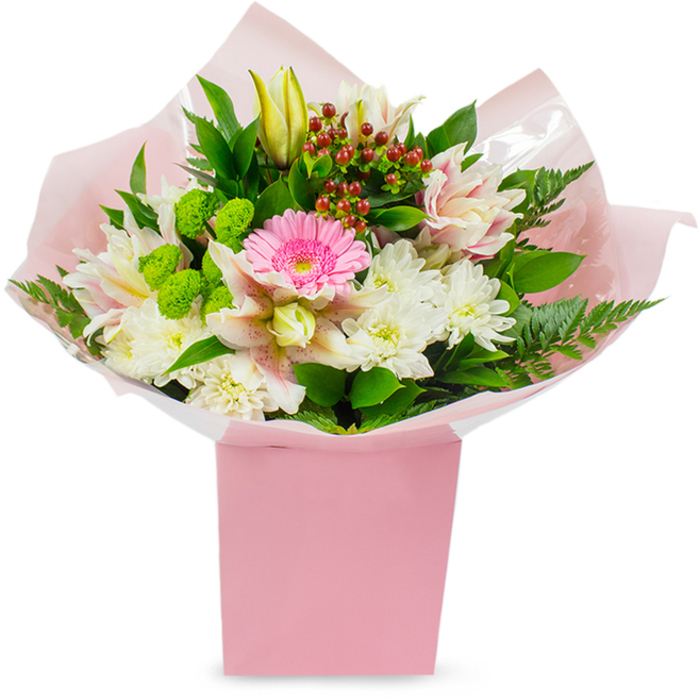 Girly, fresh and gentle combination of flowers that made the day of the proud parents of a newborn baby girl. Would definitely order flowers from this company again! Great quality! I'm very happy with the service!